The Cuisinart CRHC-22B half circle wall rack keep pots and pans out of curious toddlers reach by hanging them without blocking the sightlines and bumping the heads of taller individuals. These racks are made of stainless steel with a brushed finish for luster which provides reliable support for years of use. It fits neatly against a wall to preserve open space while providing quick and easy access to cookware. The Half Circle Wall Rack Brushed Stainless Chef Classic Rack has many exciting features for users of all types. See the Half Circle Wall Rack Brushed Stainless Chef Classic Rack gallery images above for more product views. 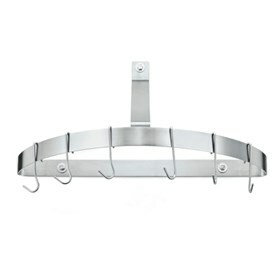 The Half Circle Wall Rack Brushed Stainless Chef Classic Rack is sold as a Brand New Unopened Item.